A) BUST: Place the tape measure under your arms and circle the tape around the fullest part of the bust. B) WAIST: Wrap the tape measure around your natural waistline . Keep the tape comfortably loose. C) HIPS: Measure your hips by circling the tape measure around the fullest part of your body between your waist and the top of your legs. D) HOLLOW TO WAIST: The hollow just under your neck to your waist. E) LENGTH FOR A DRESS: Measure for the crest of your shoulder, straight down over your breast to the top of your instep. 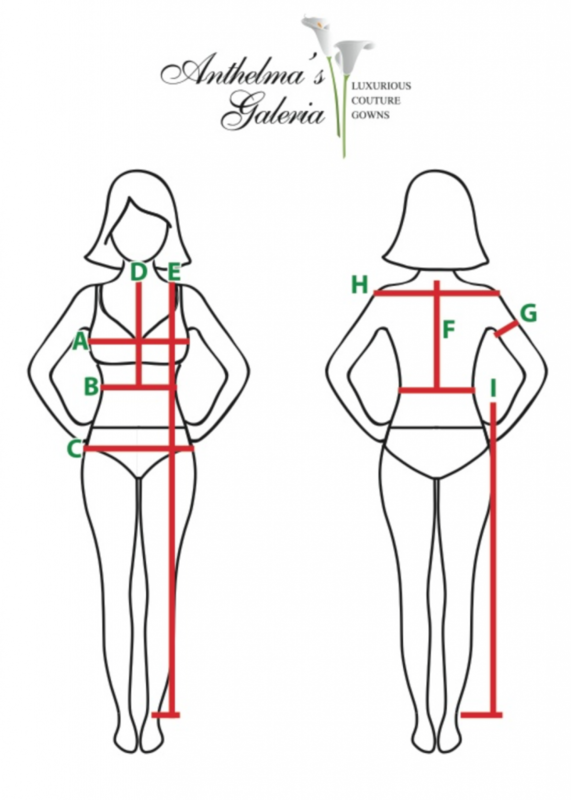 F) NECK TO WAIST: Measure at the nape of the neck all the way down till the waist. This size chart is for your reference only, please include your exact measurement of your body. We have special patterns for your body type. Missy size, and plus size women. Garments made to measure in design and material that the client chooses. Wedding dresses, bridesmaids, proms and accessories to give a personalized touch in your special event. Prendas de vestir realizadas a la medida en diseño y material que el cliente elija. Vestidos de novia, madrinas de honor, proms y los accesorios para dar un toque personalizado en tu evento especial.